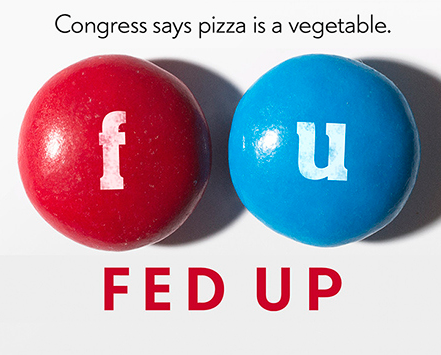 The film intends to piss people off about the state of food marketing and the inability of the government to make changes to protect our collective health, especially that of American children. I came across my hand-scribbled notes I took while watching Fed Up and listening to the panel afterwards. I’ll share them here. In some cases, I wrote the author of the quote. If not, it is likely a quote or phrase from the movie’s narrator, Katie Couric. Plenty of people are non-obese but sick on the inside. This is everybody’s problem. It touches all of us. A bowl of corn flakes, no added sugar. A bowl of sugar, no added cornflakes. It’s the same thing once it passes your palate. 600,000 food products in grocery stores. 80% have added sugar. If we have Meatless Mondays, we should have Sodaless Sundays. Would LeBron James or Beyonce sell cigarettes? Laurie David on celebrity food endorsements (soda, Gatorade, etc.). You can’t actually be on your cell phone and chop a carrot at the same time. Cooking helps us disconnect and connect with what’s important. Laurie David on the importance of cooking. Eating junk isn’t effortless. Sally Sampson of ChopChop magazine on the argument that eating healthy foods costs more and takes more effort. Start small, make a sandwich. It takes 3 minutes. Sally Sampson on ‘cooking’ at home. Spend all the money on healthcare on teaching people how to cook. Dr. Eric Rimm of Harvard School of Public Health on shifting our priorities. We have to have better spin than they do. Eric Rimm on how public health needs a public relations makeover to compete with food marketing campaigns. The discussion needs to be about food. Not about weight. Sally Sampson on reframing the issue. Go see this film and form your own opinions. Start a discussion with friends and colleagues. Rip the film apart. Compliment the parts you agree with. Get political. As a nutrition professional, I completely agree with my fellow sports dietitian and diabetes educator Sally Hara on her recent post. Nutrition isn’t as simple as pointing fingers. Helping change a massive system where the deck is really stacked against the good guys (public health & qualified nutrition professionals), isn’t easy. Placing blame, that’s easy. Here’s my take away message: Don’t wait for the system to be fixed. It won’t be. Just try to make yourself better. Make a small but lasting change to your lifestyle. Motivate and engage those that you care for to do the same. That’s how you help yourself and your community.